This report deals with some aspects of the restoration of masonry buildings with windows, floors and roof trusses in wood. It is a product of good cooperation between students from Estonian Academy of Arts in Estonia, Gotland University in Sweden and Novia University of Applied Sciences in Finland. The report is a result of intensive course no. 2 within the joint project Sustainable Heritage which is financed by the Nordic Council of Ministers through Nordplus funds. Each chapter is written by students of different nationalities: the Estonian students concentrate on the necessary methodical approach that is vital in the documentation of building parts, the Swedish group gives a description of the performed hands–on mural work and the Finnish students look closer at the use of wood in historic buildings. Thorough and correct preliminary work (including inventory) is the prerequisite for the execution of the repairs and restoration work to be done professionally, sparingly and efficiently. Making an inventory is also very useful when collecting the historical data about a heritage site. It explains the technical and cultural value of the building to its restorer and owner. This manual is divided into different parts according to different aspects of inventory making. Each sub–chapter has a topic giving detailed information about practical questions which every maker of an inventory must deal with. One of the hands–on jobs during the intensive course at Seidla Manor in Estonia was to repair the gate posts of the garden wall. Part 2 of the report starts with an analysis of the materials that have been used to construct and repair these in the past. This leads to a documentation of damage and finally to suggestions of how to repair these gate posts or any masonry structure of lime stone with similar (also typical) decay. The report can be used as a guideline to sustainable repairs of historical masonry. Photos of the performed work illustrate students and teachers in action. 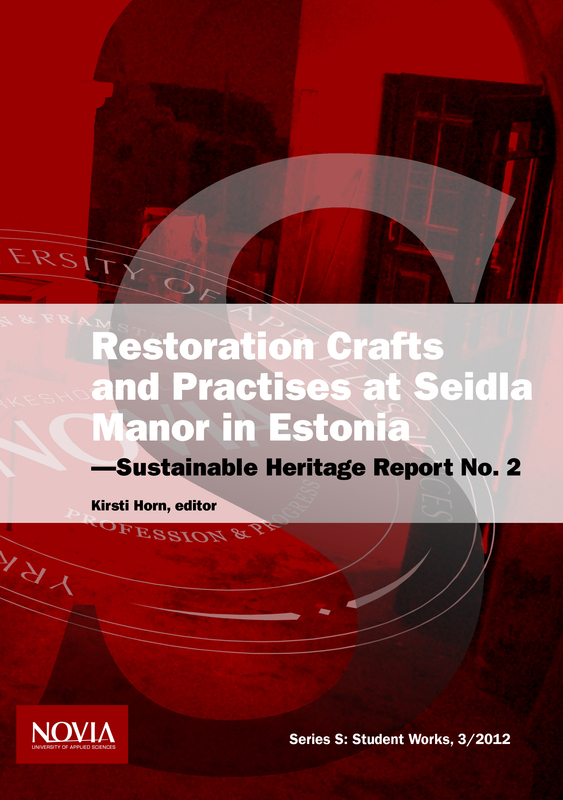 For the Finnish construction engineers and site managers the most useful information and exercises at Seidla Manor were about wood: how its condition can be evaluated and how it should be repaired. This part of the report describes not only the material but also the decay that might occur in it and how it ought to be prevented in a sustainable fashion. In addition, the hands–on exercises which were performed during the intensive week, are reported in such a way that the reader can apply the described methods for similar situations in his own house. The best method for all repairs of historic buildings is, of course, to find a well informed and experienced designer, builder and conservator and consult them!